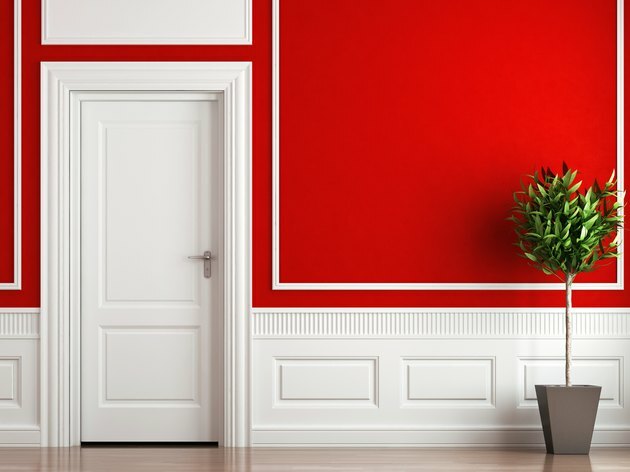 Adding distinctive architectural detailing to walls with different types of molding and trim is a relatively inexpensive way to give any room an upscale look. From chunky layers of crown molding to thin, delicate strips of trim, these accents can turn an ordinary wall into an extraordinary showcase. Although some projects require only basic woodworking skills, others may require more advanced experience when multiple cuts and measurements are involved. Decorative molding gives walls an upscale look. Use thin strips of trim to create decorative panels on walls with a technique known as picture framing. Size the panels to fit within the available wall space, spacing them equally on your walls and aligning the edges for a uniform appearance. Paint the wall inside each panel two to three shades lighter or darker than the surrounding wall color. Alternatively, embellish each panel's interior with wallpaper or hang equally spaced pieces of framed art, photos or mirrors. Use long vertical rectangles to fill large areas or narrow, horizontal rectangles over doors or windows. Create a layered look using panels within panels, or vary the shape by using curved trim pieces in corners. Mount a grouping of panels to create large geometric designs on the wall. In a room with high vaulted ceilings, crown molding installed at normal ceiling height or about 8 feet high around the perimeter divides tall walls, making the room feel less imposing. Create a customized, upscale look on kitchen cabinets by installing crown molding along the cabinet tops. Specially designed crown molding with a built-in ledge to accommodate LED strip lights and a built-in channel to run wiring allows for easy installation of cove lighting. Totally hidden from view, the light strip casts a warm glow against the ceiling. Crown molding made from lightweight materials such as polyurethane offers more flexibility than wood molding. It has the ability to conform to curves and comes pre-primed and ready for paint or stain, or can be used as is. A simple piece of molding 2 to 3 inches wide, installed horizontally at one-third the distance to the ceiling, divides walls into visually pleasing proportions. Known as a chair rail, this dividing line helps establish a sense of scale and proportion in a room. Accentuate the scale of the wall even further by painting it a different color or installing wainscot paneling from the rail to the floor. Create faux paneling under a chair rail by first sanding and priming the wall and then installing evenly spaced picture-frame panels made from wall trim. Cover wall and trim with semigloss paint. Another option is a picture rail or plate rail which is installed at two-thirds the distance to the ceiling. This type of trim has a narrow grooved ledge for displaying framed pictures or decorative plates and adds dimension to an interior. Enhance ordinary casements around doors and windows with built-up trim made by layering stock trim pieces of varying sizes. Three pieces of trim is typically enough, starting with the flat casing pieces that cover both sides and the top of the window or door. An edge band is added next, followed by filler trim, installed just inside the edge band. Create a latticework pattern under a chair rail by nailing narrow strips of flat molding both horizontally and vertically between the rail molding and baseboard trim. Make a simple coatrack by installing a flat piece of molding horizontally at two-thirds the ceiling height. Paint the molding to complement the wall color and install equally spaced knobs or hooks along the molding's length. What Is the Difference Between a Coffered & a Tray Ceiling?